Authority: 10 U.S.C. 5041, Headquarters, US Marine Corps; Marine Corps Order P1700.27B, Marine Corps Community Services Policy Manual (MCCS); Marine Corps Marathon Charter effective 27 Mar 2007; and SORN MMC00010. Purpose: To register, acknowledge and promote participation in Marine Corps Marathon Organization events. Information is used to plan, organize, coordinate and execute the events and communicate with the runners and volunteers before, during and after the event to include publication of finisher results, finisher certificates and race photographs, videos and motion pictures. Data and photographs, videotape, motion pictures and other recordings may be used by the Marine Corps Marathon Organization and its select sponsors for surveys, publications on websites, race programs and promotions, newspaper articles, newsletters and other race marketing purposes and runner enhancements. Routine Uses: Information is accessed by Marine Corps Marathon Organization personnel with a need to know to meet the purpose. Information may be provided to television, online and print media to provide publicity on the Marine Corps Marathon Organization events and to selected sponsors approved by the Marine Corps Marathon Organization. A complete list and explanation of the applicable routine uses is published in the authorizing SORN available at https://dpcld.defense.gov/Privacy/SORNsIndex/DOD-wide-SORN-Article-View/Article/570650/mmc00010/. Disclosure: Voluntary. However, failure to provide the information may result in ineligibility to participate in the Marine Corps Marathon Organization events. The public reporting burden for this collection of information, 0703-0053, is estimated to average 5 minutes per response, including the time for reviewing instructions, searching existing data sources, gathering and maintaining the data needed, and completing and reviewing the collection of information. Send comments regarding the burden estimate or burden reduction suggestions to the Department of Defense, Washington Headquarters Services, at whs.mc-alex.esd.mbx.dd-dod-information-collections@mail.mil. Respondents should be aware that notwithstanding any other provision of law, no person shall be subject to any penalty for failing to comply with a collection of information if it does not display a currently valid OMB control number. Registration for the Belleau Wood 8K will open on February 27, 2019 at 12:00 p.m. (noon) eastern time. Entries will include a technical shirt, commemorative bib and finisher medal. The Crossroads Challenge is a combination registration that includes both, the Belleau Wood 8K and Run Amuck. An option to participate in Recon Ruck and Run Amuck also exists. 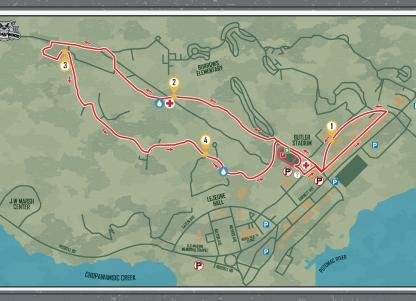 Participants will complete the 4.97 mile run before embarking on Run Amuck. 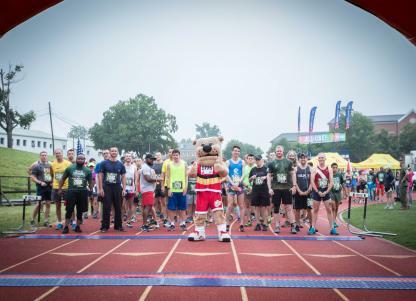 All events start and finish at Butler Stadium in the heart of Quantico, known as the “Crossroads of the Corps.” The Belleau Wood 8K begins at 6:20 a.m. Participants must complete the 8K by maintaining no more than a 20 minute-per-mile pace before the final Run Amuck wave launches at 10 a.m.
Crossroads Challenge finishers will earn a special medal in addition to the Belleau Wood medal and Run Amuck coin. While runners may register for both events separately, only those who sign up for the Crossroads Challenge are eligible for the special medal. There is no option to participate in both, the 8K and Ruck. After registering for the Belleau Wood 8K some runners unfortunately are unable to participate. These runners may opt to transfer their entry to a non-registered runner through the Transfer Program. The MCM doesn't assist in the identification of individuals to receive a transfer. Runners often find transfer partners on the MCM Facebook page. Runner-to-Runner: Runners currently registered for the Belleau Wood 8K have may transfer an entry to another runner. There is a $25 transfer fee (plus processing) associated with transferring between individuals. Either individual involved in the transfer may pay this fee. Event-to-Event: Runners have the option to transfer an entry to another event hosted on June 15. Runners will not be refunded the difference between events and will be required to pay the difference in registration fees. When transferring an entry, runners do not receive a refund on registration fees. Any such monetary transactions must be handled directly between the transferring runners. Entries may not be transferred more than once. The MCM Motivational Dinner, hosted aboard Marine Corps Base Quantico, will be held on Friday, June 14, offering runners, guests and the community the opportunity to dine where Marines dine, receive inspiration from accomplished U.S. Marine athletes, and engage in military camaraderie with fellow runners while enjoying a delicious pasta dinner at the Clubs at Quantico. The program will feature the Marine Corps Base Quantico Ceremonial Platoon providing colors with the Quantico Marine Band playing the National Anthem and traditional Sousa marches. The menu offers multiple pasta options and sauces, healthy salads and warm cookies for only $20 per person. For those attending the dinner and participating in the events on June 15, a special concierge Packet pick-up service will be provided. While the dinners will be held on the eve prior to scheduled MCM Event Series runs, participation in these events isn’t required to purchase tickets. LtCol Joseph Shusko, USMC Ret. is a decorated veteran who served the United States Marine Corps for more than 40 years. He is an accomplished aviator who spent the majority of his career flying helicopters. While serving as a White House Liaison Officer (WHLO) at HMX-1, he was designated a Presidential Helicopter Pilot under the Reagan Administration. In August of 2003, Shusko assumed command of the Marine Corps Martial Arts Center of Excellence. He has been instructing and participating in martial arts and physical fitness since the early 1970's. Active in his local community, Shusko is a Stafford Sheriff Department volunteer deputy. Lieutenant Colonel Shusko is also an associate and instructor for Resolution Group International - a conflict resolution training organization. He has taught "Values, Morals and Ethics" throughout the United States and abroad, and is the author of "Tie-Ins For Life: Stories That Teach Great Values and Inspire Moral Action." Lieutenant Colonel Shusko was born in Fort Monmouth, New Jersey. He is a 1977 graduate of Rider University. He is also a graduate of the Marine Corps Amphibious Warfare School and the Marine Corps Command and Staff College. In partnership with Always Advancing and sponsored by VA Runner, local running specialty store, the Distinguished Participant medal will be presented to runners who have participated events on four specific dates during 2019 including Historic Half events (13.1, Semper 5ive, Devil Dog Double) in May; Run Amuck, Belleau Wood 8K or Recon Ruck in June; the Quantico Tri or Quantico 12K in August; and the Turkey Trot 10K in November. The Distinguished Participant medal, recognizing a year-long commitment to running with the Marines, is awarded to qualified runners after they finish the Turkey Trot in November. A wide variety of volunteer positions will be available offering numerous ways for individuals and groups to support event day. 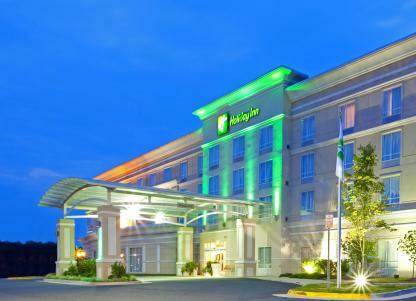 Minutes away from Marine Corps Base Quantico and the Belleau Wood 8K course, the Holiday Inn Quantico Center is dedicated to help make runners' stay unforgettable.